Garnet black color. 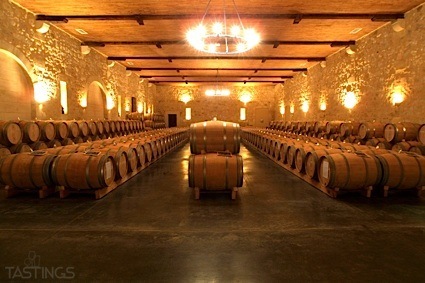 Fruity, savory aromas and flavors of mocha, caramelized bacon, and boysenberry pie with a silky, bright, fruity light-to-medium body and a polished, interesting, medium-length finish displaying accents of apples in vanilla cream, nut brittle, and cedar with fine, chewy tannins and light oak flavor. A very tasty and layered cabernet that is sure to please. Bottom Line: A very tasty and layered cabernet that is sure to please. 85 • Crush 8 2017 Chardonnay, California 13.5% (USA) $9.99. 86 • Crush 8 2017 Zinfandel, California 14% (USA) $9.99. 88 • Esser Vineyards 2014 Chardonnay, Monterey County 13% (USA) $14.99. 90 • Esser Vineyards 2014 Pinot Noir, Monterey County 13.5% (USA) $15.99. 85 • Esser Vineyards 2015 Chardonnay, Monterey County 13.5% (USA) $13.99. 80 • Esser Vineyards 2014 Rose, Syrah, Monterey County 13.5% (USA) $11.99. 87 • Esser Vineyards 2013 Sauvignon Blanc, Monterey County 13.5% (USA) $11.99. 85 • Esser Vineyards 2013 Merlot, Monterey County 13.5% (USA) $13.99. 90 • Esser Vineyards 2013 Cabernet Sauvignon, Monterey County 13.5% (USA) $15.99. 93 • Esser Vineyards 2015 Chardonnay, Monterey County 13.5% (USA) $14.99. 83 • Esser Vineyards 2014 Merlot, Monterey County 13.5% (USA) $14.99. 80 • Esser Vineyards 2014 Sauvignon Blanc, Monterey County 13.5% (USA) $11.99. 90 • Esser Vineyards 2014 Cabernet Sauvignon, Monterey County 13.5% (USA) $17.99. 87 • Esser Vineyards 2016 Merlot, Monterey County 13.5% (USA) $12.99. 86 • Esser Vineyards 2014 Cabernet Sauvignon, Monterey County 13.5% (USA) $10.99. 84 • Esser Vineyards 2015 Pinot Noir, Monterey County 13.5% (USA) $14.99. 87 • Esser Vineyards 2017 Chardonnay, Monterey County 13.5% (USA) $13.99. 87 • Las Palmeras 2014 Red Blend, Monterey County 13.5% (USA) $14.99. 92 • Las Palmeras 2013 Cabernet Sauvignon, Monterey County 13.5% (USA) $16.99. 87 • Las Palmeras 2014 Chardonnay, Monterey County 13% (USA) $14.99. 83 • Las Palmeras 2014 Red Blend, Monterey County 13.5% (USA) $13.99. 82 • Las Palmeras 2014 Chardonnay, Monterey County 13% (USA) $14.99. 89 • Las Palmeras 2015 Chardonnay, Monterey County 13.5% (USA) $14.99. 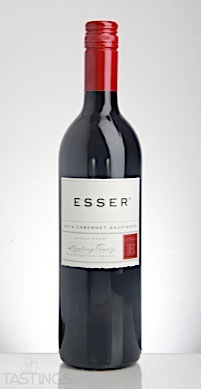 Esser Vineyards 2014 Cabernet Sauvignon, Monterey County rating was calculated by tastings.com to be 90 points out of 100 on 9/25/2017. Please note that MSRP may have changed since the date of our review.